If you’re been reading my blog, you know that I spend an inordinate amount of time thinking about, watching tv shows about, searching out, and cooking food. I am not sure if that makes me a “foodie,” a “food snob” or something else less complimentary and more Freud-diagnosable. In any case, I care deeply about what I eat and usually try to avoid anything not delicious. Which brings us to our January trip to New York. I kept hearing about Shake Shack – on food tv, in magazines, etc. Let me preface this by saying that a fast-food hamburger is extremely far down on my list of culinary sins – while I’ll admit I enjoy a fajita from Taco Cabana on occasion, I pretty much never eat fast food hamburgers (I worked at McDonald’s as a teenager – ‘nough said). 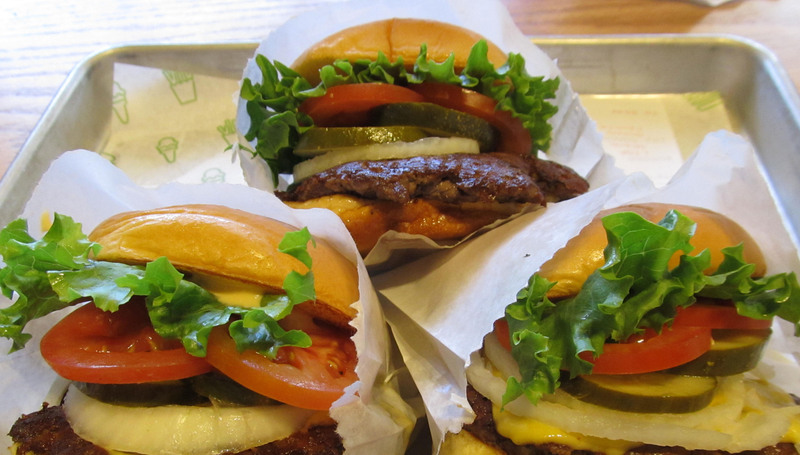 BUT, I just kept hearing about these darn Shake Shack burgers – they sounded so “foodie” for a chain…. So, we’re in New York and not that far from one of the many Shake Shacks in town (they started in NY)…unlike me, Steve does appreciate a fast-food hamburger now and again (and again)….so, I figured he could eat one and tell me what all the fuss was about! Since it was, as you recall, 8 degrees out, most New Yorkers were hunkered down and the line and wait was not the 45 minutes+ I’d heard about, but a more manageable 10-15. And then the burger came….and it looked so appetizing…and smelled so good….and Steve started making “YUM” sounds….so of course I had to try a bite for myself…. OMG! I swear I don’t know what it is about those burgers, but they are STUPID DELICIOUS!!!! I was sooooo sad at that point that I hadn’t ordered my own burger…and I left with that unsatisfied feeling you have when you’re craving something you can’t (or shouldn’t) have. Seriously – I could not stop thinking about that burger and how I really wanted one of my very own. Unfortunately, it was our last day in New York, so I was forced to leave with my craving left un-sated. But like an unrequited love, I could not get that burger off my mind and I knew I would not rest until it was mine…. Which brings us to our Spring Break road trip. Sometime before that trip I had been on Shack Shack’s website reading the ingredients and trying to glean what makes their burgers unlike any I have ever had. (It seems to be an un-replicable combination of high quality meat, Martin’s potato rolls, a thousand-island-esque sauce, crispy fresh pickles… and MAGIC!) And, what do you know, there’s an announcement that a new Shake Shack just opened in the NY, NY hotel in Las Vegas, which just happens to be one of the places we were driving to on our upcoming road trip!!! We got into Vegas just about dinner time and headed straight to Shake Shack. I was worried that the reality of the burger would not live up to the taste in my imagination, and that after pining away for almost 3 months I would be disappointed (how could it really be that good?!). But it was even better than I dreamt (how many things can you say that about?!). As a matter of fact, Steve and I unabashedly decided we would come back for lunch the next day (11:00 is late enough to be called “lunch,” right?). And ya know what – just as delicious and magical as the day before! And now, here I sit at my desk, nowhere near a Shake Shack, pining away for my once-requited love, but facing the fact that it is once again unrequited…. I know a lot of people feel as you do about these burgers, but I think they (and the whole Shake Shack experience) are overrated. It’s funny cause I was expecting to feel the same way, so I was surprised by my own delight. I think the lack of long lines helped our positive experience. We once waited over 2 hours to eat at Pizzeria Bianco in AZ, and I don’t care how delicious that pizza was, I was GRUMPY at the end of the day!